Young Palestinian women in Israel are a group that is often ignored and repressed by society. That is why our partner organisation al-Tufula runs a project to empower these young women and encourage them to continue their studies. The result is a new generation of female leaders ready to change society. “I never thought I was the kind of person who could influence society. But today, I know I can contribute to change. Every day, I see more and more social restrictions disappear – living proof that change is possible. That knowledge has changed my outlook in life,” says Aghsan Khalilihe. Aghsan is one of the participants of al-Tufula’s programme to empower young Palestinian women in Israel and increase their participation in society. Al-Tufula is one of Kvinna till Kvinna’s Palestinian partner organisations working in Israel. Since 2007, the organisation has helped young Palestinian women in Nazareth believe in themselves and their potential. The programme invites young women to participate in volunteer work, leadership training and other activities that encourage them to be an active member of society. Al-Tufula also encourages young women to continue their studies by attending university or college, to increase their chances of independence. Nadera Saadi works as project leader for al-Tufula’s programme since it started nine years ago. The programme was the result of Nadera and her colleagues realising how little support and attention society gives to women between the ages of 17 and 21– a life phase that determines whether young women find their own way in life or forever continue to be steered by the expectations of their family and society. “We run this program to meet the needs of young women who have just graduated or are in the final years of high school. They get support and advice on their educational choices, capacity-building, a chance to develop their political and societal awareness, and the possibility to participate in volunteer work and make society a better place,” summarises Nadera Saadi. Serine Hasan took part in al-Tufula’s programme when she finished high school six years ago. Soon, she will graduate as an architect from the university of Tel Aviv. She identifies many obstacles facing young Palestinian women in Israel. “Stereotypes are a huge barrier for young women in our patriarchal society. Then there are the difficulties we face as a minority in Israel. It’s not easy being an ambitious woman with goals in life – especially not when you also happen to be Palestinian,” muses Serine. Al-Tufula’s programme boosted Serine’s confidence and gave her support to face and overcome barriers in her life. Serine and the other young women still get to meet the programme’s mentors once a week, to talk about their academic studies, future choices, identity and independence. “The programme provided me with a safe platform from which to start a new phase in life and begin my studies. I’ve always wanted to be independent and influence society. Al-Tufula allowed me to nourish that side of me,” says Serine. Through their volunteer work, the young women in al-Tufula’s programme get to meet other marginalised groups in Palestinian society, including in the West Bank. Abeer Bishtawi is one of last year’s participants. She looks back fondly on her experience. 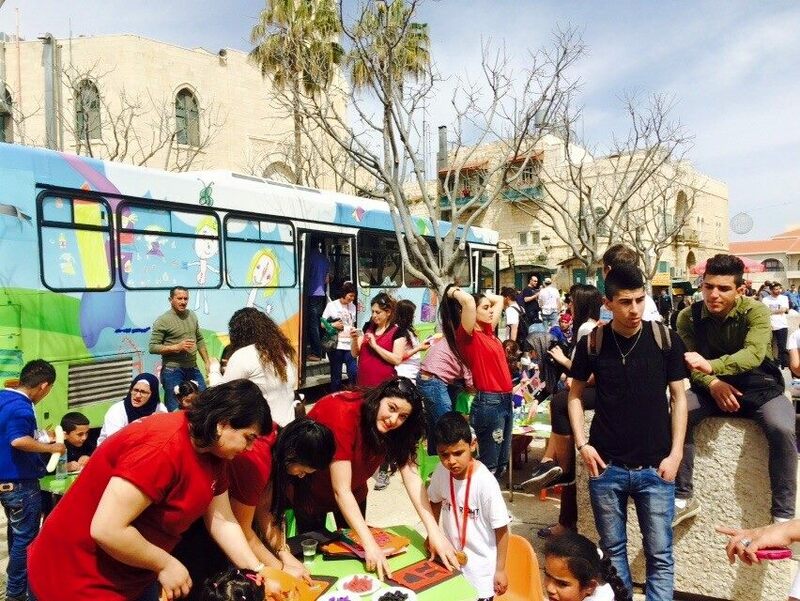 “I got to work with children by visiting them with an art bus, a bus travelling around Palestine with a set of tables, chair and art supplies for the children. Volunteering taught me how important it is to help out other people, but it also gave me valuable leadership skills,” recalls Abeer. Project leader Nadera Saadi is happy with the results al-Tufula’s programme has achieved in the past nine years, as well as with the journey its participants have undertaken.